Please note these are approximate days, to be adjusted to the actual arrival date in Antarctica and climbing schedule. Depart Your Country of Origin. If possible you may want to arrive on this day, in case of lost luggage or flight delay. Arrive Punta Arenas, Chile. From the airport in Punta Arenas, you’ll be escorted to your hotel. We’ll schedule a time to check your Antarctic clothing and ensure that nothing has been inadvertently forgotten. We’ll discuss Leave No Trace principles and how best to preserve the pristine Antarctic Wilderness. Please arrive early in the day if possible as we try to complete gear check on this day in early afternoon. Gear Check, Final Prep; Slide Show, Gear Weighing, City Exploration. After final gear preparations; we usually have time to explore the city. Late in the afternoon, we will have an Antarctica slide show and lecture conducted by ALE. The lecture includes information on your flight south, the current weather situation, and what to expect on your arrival in Antarctica. We will also be weighing gear, as all gear that will fly to the glacier will be checked in at this time. Depart Punta Arenas, Chile. Fly to Antarctica. Fly 4.25 hours to Antarctica by private transport jet. 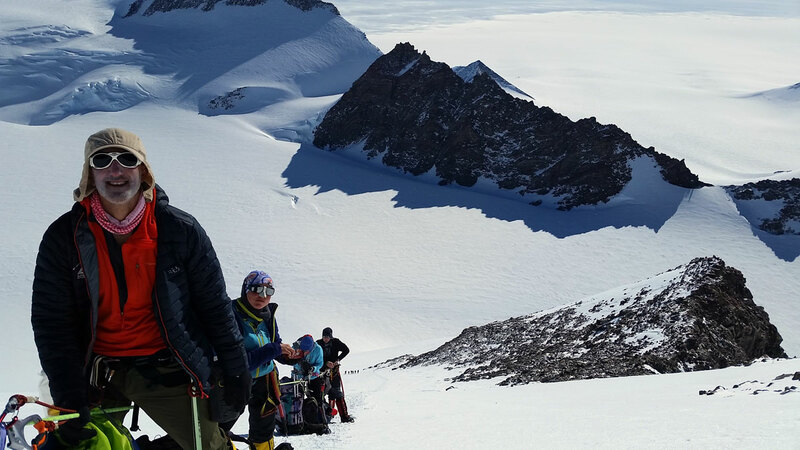 Transfer to ski aircraft and continue to Vinson Base Camp at 6,900 ft. (2,100 m) on the Branscomb Glacier. You’ll be notified of our departure time as soon as we have a clear weather forecast, and given around two hours before we pick you up at the hotel. Make sure your bill has been settled and that your “city” clothing has been left at the hotel. After completing customs and immigration formalities at the airport, we’ll proceed to the aircraft for a photo session before climbing on board. We’ll fly to Union Glacier Camp. If the weather permits, we’ll transfer our equipment from the Ilyushin 76 aircraft to the Twin Otter and fly an hour to Vinson Base Camp. The pilot will be in constant contact with the base for weather updates. There have been occasions when deteriorating conditions after departure from Union Glacier have forced us to turn around and await better flying conditions. 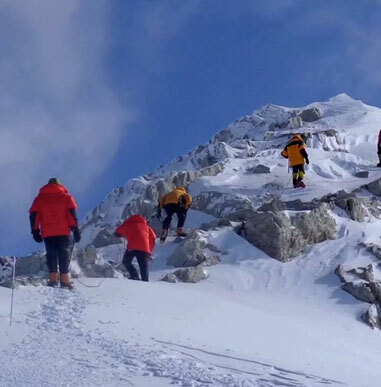 Once we land at Vinson Base Camp, we’ll review the climbing route and rearrange the loads for the journey. Vinson Base Camp: Acclimatization and Preparations. This is a day to relax and recover after several days of travel. 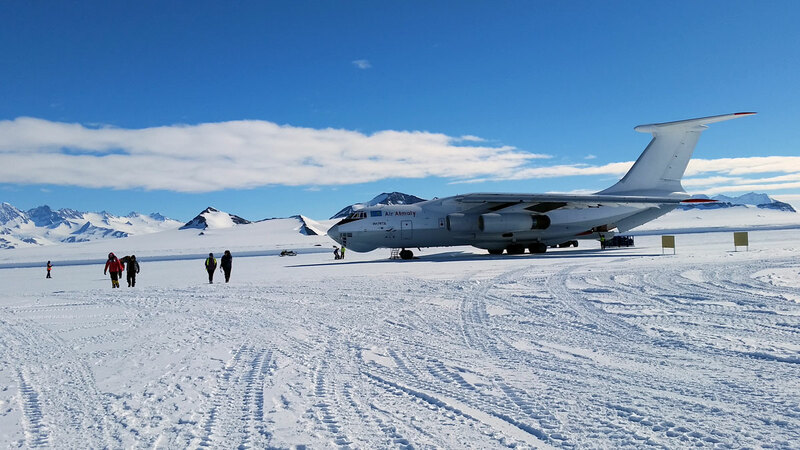 In the quiet surroundings of Vinson Base Camp, we can appreciate the beauty of Antarctica while preparing for our climb. We will load our sleds for the days ahead and, if time allows, we will take a short hike to gain familiarity with the Antarctic environment and to refine our clothing and equipment choices for the climb. Vinson Base Camp to Low Camp. 2,150 ft. (650 m) of elevation gain, 5.5 miles (9 km) of distance, 4–6 hours travel. 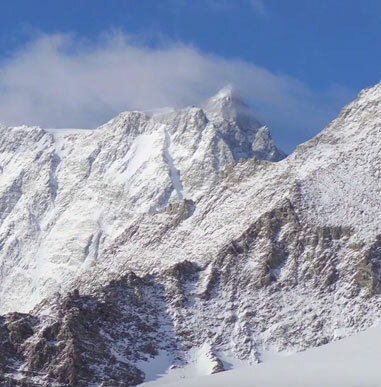 From Vinson Base Camp to Low Camp we follow the gradual rise of the Branscomb Glacier. The gentle climb is ideal for pulling sleds allowing us to lighten the loads in our packs. Due to crevasse hazard, we will travel roped together today and throughout our time on the mountain. At Low Camp (elevation 9,000 ft./2,750 m) the guides build a cooking/dining shelter for our group. 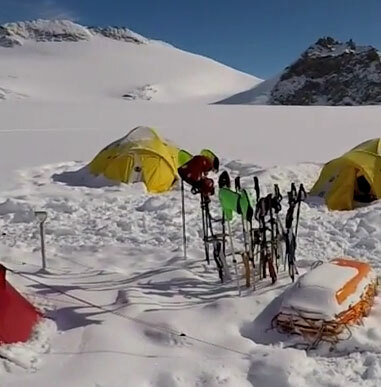 Depending on conditions, we may overnight here or cache equipment and return to Vinson Base Camp. The following day we will re-ascend from Vinson Base Camp, acclimatize at Low Camp, or continue our climb up the mountain. Low to High Camp (this includes some extra days). 3,350 ft. (1,020 m) of elevation gain, fixed ropes on slopes up to 45 degrees, approximately 6–10 hours travel. We ascend to High Camp (12,400 ft./3,770 m) when conditions are suitable and the forecast indicates stable weather ahead. We may carry all of our equipment in one push, or we may choose a “load carry,” overnighting back at Low Camp and re-ascending the next day with lighter loads. These choices will depend on weather and group fitness. Our route takes us up the broad mixed spur at the northern end of the Branscomb Ridge, offering fantastic views of Mount Shinn and the glaciers below. We ascend fixed ropes on snow slopes up to 35/40 degrees. Snow conditions can vary from soft to hard and windblown with icy patches. 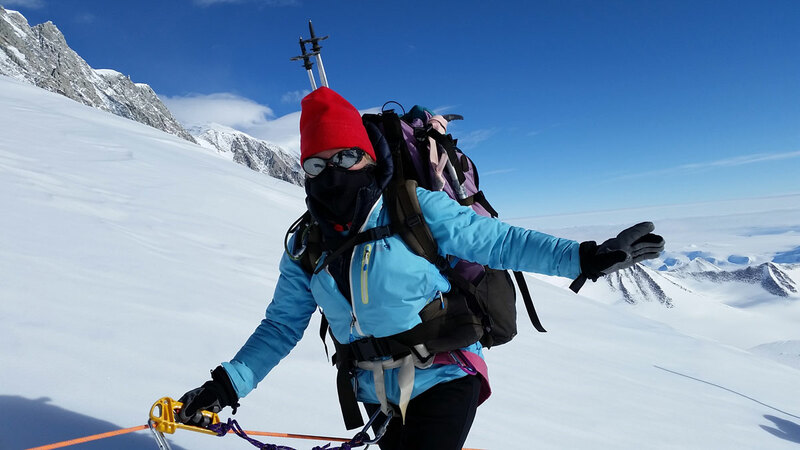 From the top of the fixed lines to High Camp takes about 1.5 hours ascending the gentle snow slopes of the summit glacier. This section of the route can be very exposed to the wind, requiring care to prevent cold injury. The facilities at High Camp are more basic than at camps below. We cook and eat simple, dehydrated meals in our tents, or outside if the weather is calm. 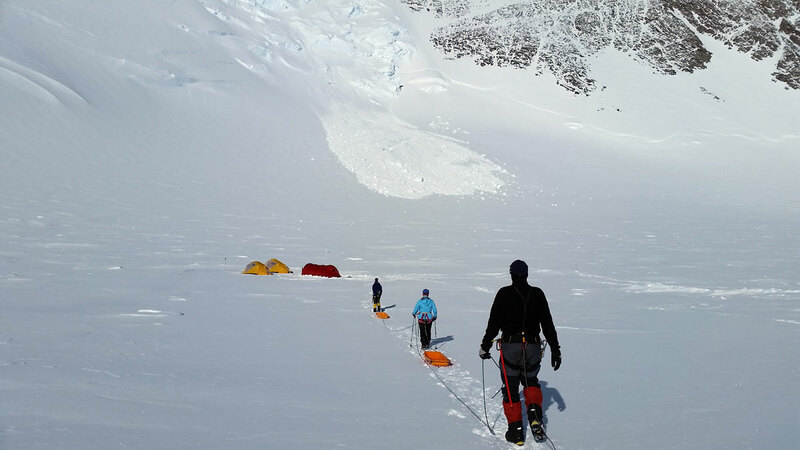 Our next day is normally spent resting and acclimatizing at High Camp to give everyone the best chance of summiting. 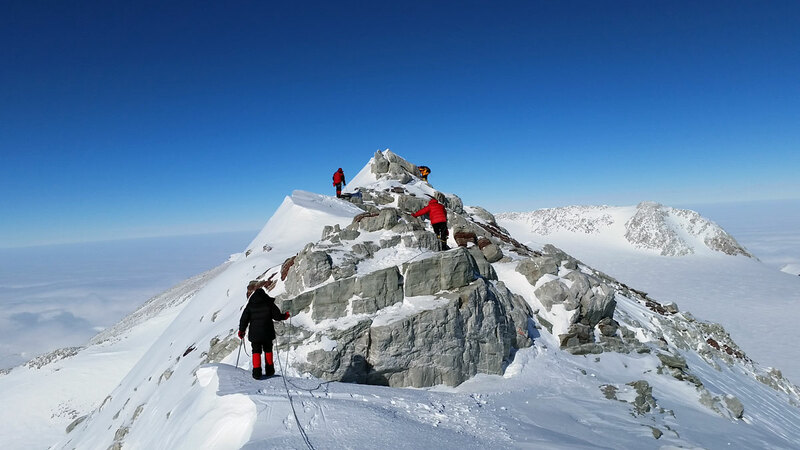 High Camp to Vinson Summit. Return trip from High Camp – 3,670 ft. (1,120 m) elevation gain, 9 miles (14 km) distance, 9-12 hours travel. We make our summit attempt on the best weather day possible as the route is exposed and subject to high winds. The majority of the route is along the Vinson summit valley, with a short, steeper snow and ice slope leading to the spectacular, rocky, summit ridge. The views from the summit are breathtaking. Mount Gardner, Tyree, Epperly, and Shinn dominate the foreground, surrounded by impressive peaks that rise from the vast ice sheet below. Here, at the top of Antarctica, the true scale and majesty of the continent are overwhelmingly apparent. We’ll take time to savor the experience and take photos before retracing our steps to High Camp. Descent to Vinson Base Camp. 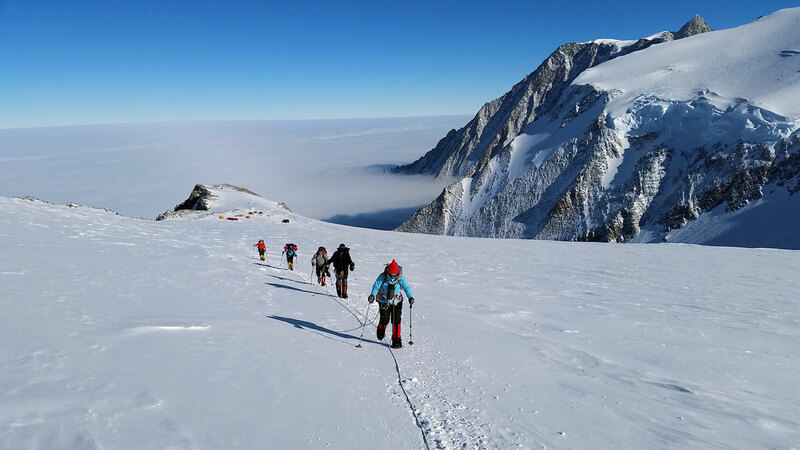 The descent to Vinson Base Camp is usually achieved in one day from High Camp, retracing our route down the fixed ropes and along the Branscomb Glacier. At Vinson Base Camp, we celebrate our summit with a hearty meal and a toast to our team. Return to Union Glacier by Ski Aircraft. Once we’re back in Base Camp and a full aircraft load is ready, the guide will inform Union Glacier and an aircraft will be dispatched to collect you. There will be opportunities to meet and trade stories with other adventurers and, if conditions allow, we may explore the scenic peaks nearby camp (these can also be used as extra climbing days as needed). Return to Punta Arenas, Chile. Weather permitting, the aircraft from Punta Arenas will arrive with a new collection of avid explorers and you depart for the final leg of your Antarctic experience. Our staff will meet you at Punta Arenas airport and transfer you to your hotel. No two Antarctic experiences are exactly the same. This is part of the excitement and adventure of Antarctic travel. The itinerary above highlights typical activities and experiences. Exact timeline and details will vary from trip to trip. Trip length may vary by departure. Please anticipate delays and do not plan anything for at least a week after your scheduled return. Allow yourself to enjoy this unique experience without the stress of pending commitments. Note: Every effort will be made to follow the above itinerary, but it is subject to change at the discretion of our staff, based on weather and local conditions. Some departures may be slightly longer or shorter based on flight schedules to Antarctica. 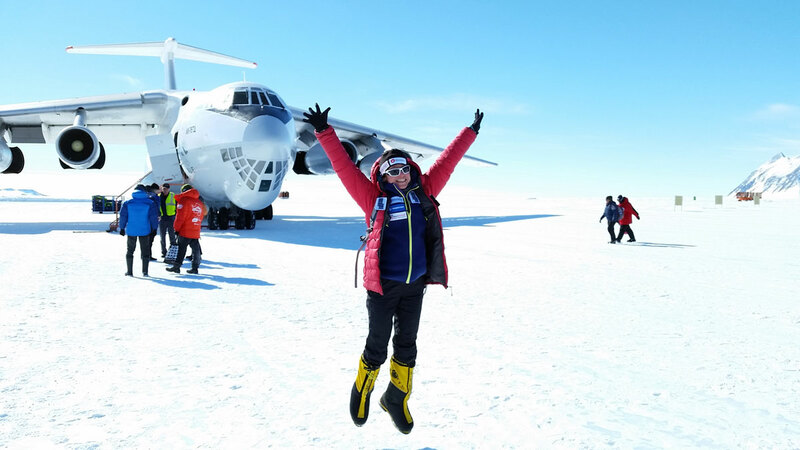 If you are interested in extending your trip to include the South Pole Ski Tour or flight to visit the South Pole, email our director of programs, Gordon Janow. Our expedition begins in the Chilean town of Punta Arenas. After a night of lodging (not included), we’ll join our partners (a local flight service) in an extensive briefing before flying to the Antarctic continent. In recent years we have seen fewer flight delays, but time enough to tour the city. Often considered the most interesting city in Patagonia, this commercial fishing port town boasts handsome turn-of-the-century architecture, financed by the bustling wool industry of a bygone era. A walking tour will lead you past the great mansions that currently house the Club De La Union and the Sociedad Menendez Behety (now Citibank) found around the Plaza Munoz Gamero. 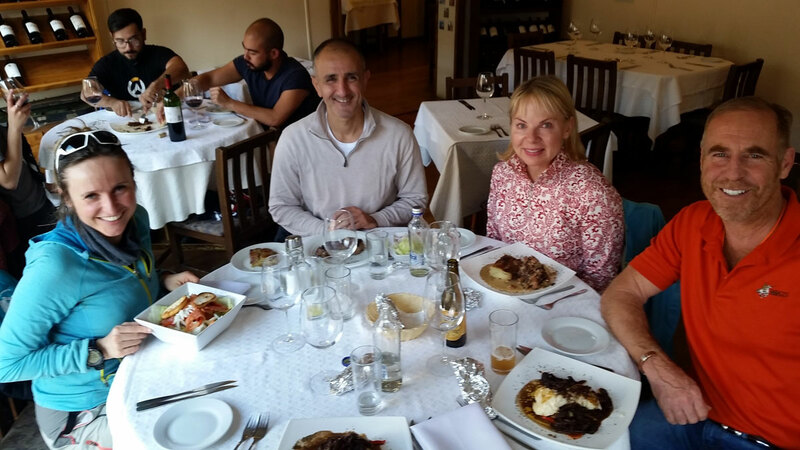 Punta is also known for its fine dining and exquisite wines. Time permitting, one should visit the Museo Regional De Magellan’s, the original Punta Arenas mansion, and take a tour of the penguin rookery to view the colony of Magellanic penguins. Note: Upon arrival in Punta Arenas, most foreigners will be asked to pay a $160 entrance fee. The flight time from Punta Arenas to the Union Glacier landing strip is approximately 4.5 hours, depending on the winds. The initial part of our flight passes over Tierra del Fuego, the southernmost point in South America. The section of ocean we’ll fly over has been notorious for its wild storms, violent winds and heavy seas. Waves higher than 100 feet have been encountered in the Drake Passage by several ships, and many early seamen lost their lives to these waters. At approximately 60 degrees latitude, we’ll reach the winter limits of frozen seas. This area of ocean is called the Antarctic Convergence and is rich in plankton and other tiny creatures that form the bottom of the food chain for Antarctica’s rich bird and wildlife colonies. This area is governed by the Antarctic Treaty. At 66 degrees latitude, we’ll cross the Antarctic Circle. Along this circle the sun never sets at the austral summer solstice and never rises at the austral winter solstice. Further south, these Antarctic days lengthen as we get closer to the South Pole, where the sun rises and sets only once a year. Further south, we’ll fly over tabular icebergs and the ice shelves from which they calve. Some of these bergs can be the size of a small country and serve as a method of transport and a home for penguins and seals. The icy continent appears at Charcot Island, close to Alexander Island, at 71 degrees latitude. The ice sheet continues to stretch inland until, in the distance, appear the spectacular Ellsworth Mountains, the highest range in Antarctica. Passing over the Ellsworth Range, our runway comes into sight. The wheeled aircraft lands on an area of blue ice 3,300 ft. (1,000 m) above sea level. The blue ice remains clear of snow because of the Katabatic winds that funnel down from the mountains with great force. This one-of-a-kind private camp is 1,800 miles from the nearest city. Union Glacier provides a warm welcome to the frozen landscape. We’ll have access to a heated and insulated dining hall, where we’ll eat all meals. It is also a great place to hang out, read a book, or talk with other explorers. Union Glacier is composed of large “Weatherhaven tents that provide comfortable dining and resting areas. Should we need to spend some days at Union Glacier, we will sleep in tents and, if possible, explore the surrounding regions with a guide. If the weather is good, we may only stop briefly at Union Glacier en route to Vinson Base Camp. Union Glacier camps also contain a small library and medical facility. 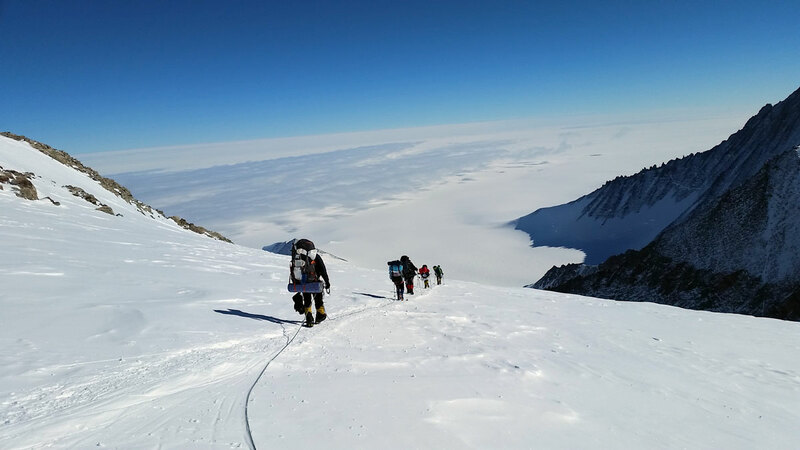 We will ascend Vinson using the “standard route.” This usually takes from five to nine days depending on weather conditions and how quickly team members acclimatize. Our climb will be a team effort with each person carrying his or her own personal equipment as well as a share of group gear, food, and fuel. 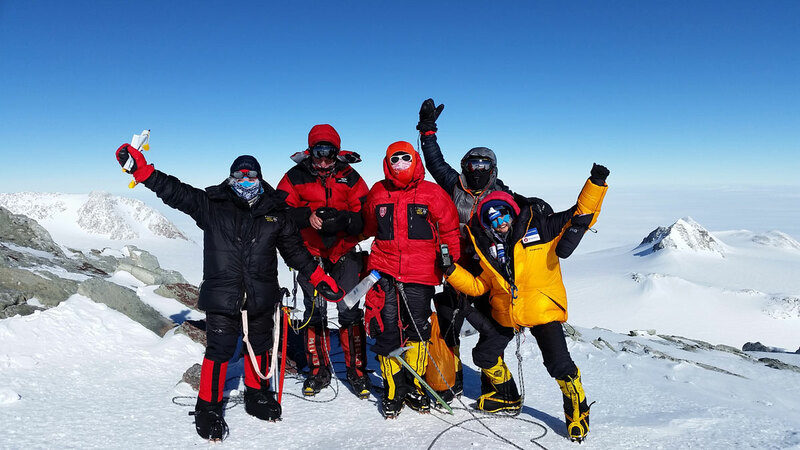 Our success rate is excellent; nonetheless, you should be aware that even though Vinson is not considered a technically difficult peak, the mountain is high, temperatures are well below freezing, and the area is extremely remote. There may be other groups on the mountain at the same time and we’ll be in contact with Base Camp by radio throughout the trip. The guide will prepare food for the group each day and climbers will be asked to assist in setting up camp in the evening. Base Camp (7,000 ft./2,133 m) is located on the lower part of the Branscomb Glacier (west side of the Ellsworth Mountains). We review glacier camping and travel techniques. Knots, rigging, anchors, and crevasse rescue are covered. After dividing our gear between backpacks and sleds, we’ll ascend the Branscomb Glacier for six miles to Low Camp (9,000 ft./2,750 m). From Low Camp, we’ll ascend to the foot of a large headwall and then up the headwall on moderate snow slopes to a broad col between Vinson and Shinn to establish High Camp (12,400 ft./3,779 m). 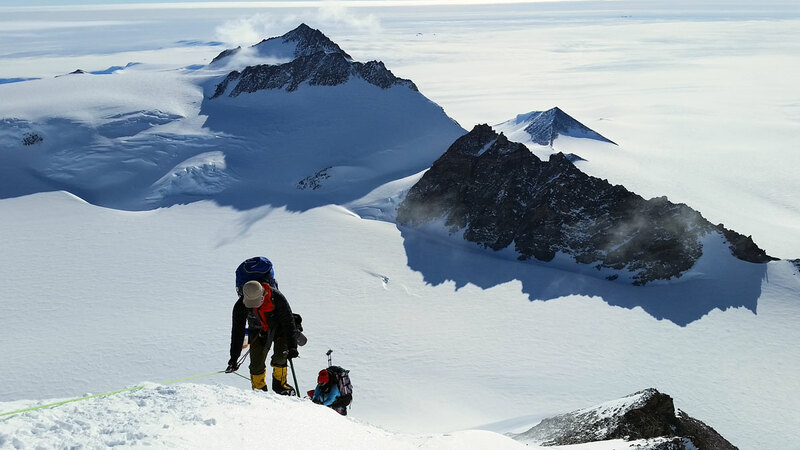 From High Camp, we’ll take in incredible views while we rest to acclimatize for the summit attempt. Summit day is a long journey that includes a 12-hour round-trip climb and a 3,000-ft. gain in elevation. 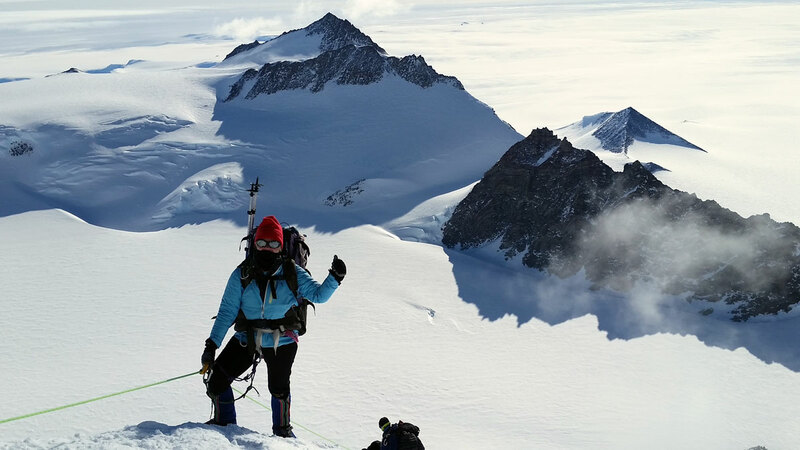 The final summit ridge is a spectacular rock and ice traverse. The views from the top are simply unforgettable!